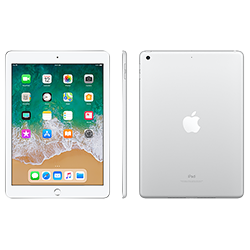 iPad features a gorgeous 9.7-inch Retina display, a powerful A10 Fusion chip, fast wireless, all-day battery life, and advanced cameras, front and back. Built-in apps include Clips, GarageBand, Pages, Numbers, and Keynote. Amazing educational apps on the App Store, including augmented reality experiences. And iOS 11 makes iPad more powerful, personal, and intelligent, so you can do more than ever before. Add Apple Pencil and iPad is a powerful new way for your child to learn like never before. AppleCare+ for iPad extends your repair coverage and technical support to two years from the original purchase date of your iPad. And it adds coverage for up to two incidents of accidental damage from handling, each subject to a $49 service fee plus applicable tax. In addition, you'll get 24/7 priority access to Apple experts via chat or phone.